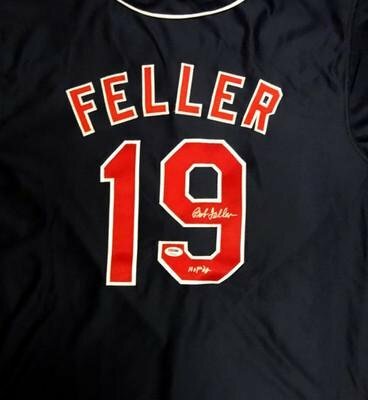 Bob Feller's Hall of Fame career and near constant appearance at sports collectibles shows made him a fan favorite across multiple generations. As a result, Bob Feller cards and autographed memorabilia are both popular and plentiful. A longtime staple on the autograph circuit, it has been joked that one of the rarest sports collectibles is a baseball Feller hasn't signed. All kidding aside, Feller amassed impressive numbers during his stellar career, which was interrupted by a four-year stint in the military. He served in the U.S. Navy during World War II, right in the prime of his pitching career. Bob Feller's baseball card checklist is interesting in that he has over 30 cards that were issued prior to his officially recognized rookie card, which in the 1948 Bowman Baseball set. Feller also has a card in the famed 1948-49 Leaf set. 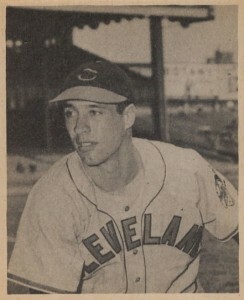 As it is widely believed that the Leaf set came out in 1949, the 1948 Bowman Bob Feller is considered by most as his lone rookie card. His first card was actually issued 12 years prior as part of the 1936 Goudey Wide Pen Premiums, which are designated in the American Card Catalog as R314. In addition, he has numerous regional and food issue releases, including Wheaties and Exhibit cards. 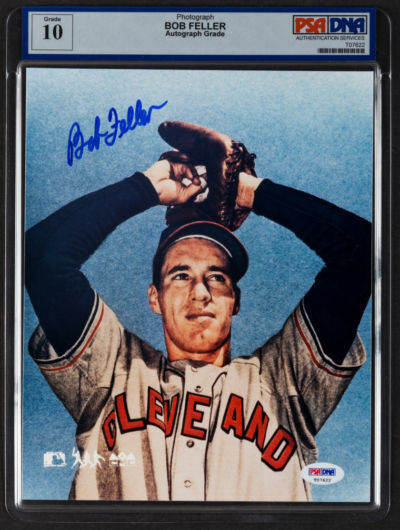 With regards to Bob Feller's modern cards, the 266-game winner and eight-time All-Star has numerous memorabilia and autograph cards. His first autograph card was part of the 1983 American Softball Association set, which included cards of retired greats. His first mainstream card was issued in 1997 Topps Stars Rookie Reprint Autographs. In 2001, Upper Deck, Topps and Donruss/Playoff would both issue memorabilia cards of Bob Feller. One of the most popular is the 2001 Bowman Heritage 1948 Reprints Relics card. 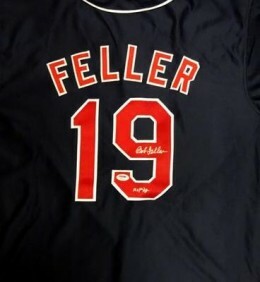 Signed Feller memorabilia, unfortunately, suffers from over supply in the marketplace. His most valuable pieces come from his playing days, particularly items related to the 1948 World Series. This is be the last championship the long-suffering Cleveland Indians won. Getting an autograph from the great Bob Feller wasn't about the value. It was about the experience. Feller was well known for taking the time to chat with fans, regaling them with stories and happily posing for pictures. The 1948 Bowman set is an extremely popular vintage set from the post-war era. A black-and-white image with no text allows for the simple shot of Feller to receive the full focus. Below you will find an example of what Bob Feller's authentic signature looks like. This can be used as a first point of reference for determining the legitimacy of autograph memorabilia, but is not a substitute for having your items authenticated by a well-respected professional autograph authentication company. Some of the trusted sources within the sports memorabilia market include the following companies: PSA, JSA, Steiner, Mounted Memories and Tristar. Click on any of the images below to view full size photos. A very legible and easy to discern signature, written in classic cursive. The letter "B" contains a series of loops which then flows into the "o" and a very narrow "b" with a small narrow loop on top and slightly larger on the bottom. The letter "F" includes an odd circle shape at the bottom to keep the pen on the item. The letters "e" and "l" are similarly written just differing in size. The letter "r" looks like an inverted "v."
SALE! Carl Hubbell & Bob Feller Signed Autographed Baseball 8x10 Photo JSA COA!